I really love mother/daughter shops. Just because I'd ideally love to run a shop with my mom, if she lived close. Edens Wake is run by Katie and her mom, Marsha. Thier shop carries a selection of pretty bags, clutches, and lovely hair accessories. this week, Katie & Marsha are generously offering a $40 gift certificate to their store, and a special reader discount! has kindly offered a special exclusive discount for oh, hello friend readers. receive 10% off your purchase - simply enter coupon code "ohhellofriend" at checkout and you'll be refunded after purchase. Hello, please tell us a little about yourself + your beautiful shop: EdensWake consists of me (Katie), and my mom, Marsha. I am thoroughly fascinated by people, and adore reading, gardening (a fairly new interest...I just ate a tomato I grew myself, how cool! ), music, cooking, Zelda, dogs, and NKOTB. How did you get started sewing your beautiful bags? My sister taught a sewing class to kids one summer, and one of the things she taught them to make were these really simple, but really cute, messenger bags. My mom taught me how to sew them, and I made a couple for myself - all my friends loved them, so I ended up making several as random gifts for them. While those were really simple and not anything like we make now, that's what started our interest in making bags! What inspires you day to day? Lots of things...I live way out in the country and am surrounded be trees and flowers and wildlife everyday, so that's definitely inspiring. Also, just random things I see in my daily life...people, clothes, photographs, etc. Any advice for aspiring small business owners? Most importantly, make sure you love what you're doing...starting any business is hard, so that passion will help give you the motivation to keep at it! Value and appreciate your customers, and treat them in a way that shows them you do. Continue learning new techniques and improving your craft, no matter how long you've been doing it. is #263 - jessica -- thank you to brandy for offering such a generous prize! don't forget to check the winner's page! My favorite item from the shop is the Red Brushstrokes - Foldover Clutch Purse with Attached Zippered Pouch! i heart this "Mustard Foldover Clutch/Wallet with Attached Zippered Pouch"
i love the rosettes on slate that your have pictured! I LOVE the Black Lace on Silver Silk Clutch Purse. So fancy! Oh my favorite is the Amy Butler Floral Foldover Clutch/Wallet with Attached Zippered Pouch - Dupioni Silk Lining!! It's so cute!! Please count me in!! I just tweeted & Tagged you with the @ohhellofriend! I'm a blog follower & now a twitter follower of you! I love the damask purse- what a pretty pattern! Rosettes on Slate and Ivory Purse. Beautiful and simple, great natural looking fabrics. Love the mustard foldover clutch! I love the featured purse and the matching clutch...so adorable! I am lovin the Red Brushstrokes - Foldover Clutch Purse. It would add a punch of color to many outfits! Beautiful shop! I love the clip on flowers and the jacquard purses. My favorite is the Rosettes on Slate and Ivory Purse. I like the Floral Print Clutch Purse Lined in Silk! I absolutely love the Brown on Burgundy Floral Bag! I really like the rosettes on slate and ivory purse! It caught my eye when I first saw this post. Loving the Rosettes on Slate and Ivory Purse. Great collection, thanks for the link! I like a lot of the items, but I really like the Flowers on Blue Pleated Purse and Paisley on Green Purse! My favorite is the black lace on silver silk clutch. So pretty! Rosette's on Slate... the one pictured is beautiful!!! Love the Brown and Gray Foldover Clutch...what a wonderful shop! I follow you on google reader and I am a facebook fan. Love your site! I would pick one of the clutches! Can't decide which one I like the most-they're all cute! I love the rosettes on slate bag - gorgeous! so pretty! I love the Slate and Ivory Foldover Clutch, its absolutely lovely! I love all their floral hair pins, but my favorite item is the black lace on silver clutch, what a great combination. I absolutely adore the Paisley Clutch Purse.I think that the garment of this clutch is utterly sweet and very me. It's just something that not anyone could have and that makes this clutch and all the other products in that shop unique and astonishingly beautiful. flowers on blue pleated handbag. Dreamy! I really love the Red Brushstrokes Foldover Clutch Purse - my mom would love it to separate some items in her purse! It would be a lovely gift! i absolutely love the Rosettes on Slate and Ivory Purse! gorgeous!! i hope i win!! i'm in love with the amy butler floral clutch! gorgeous! i'm not following you on twitter! Love love love the damask bag. I'm already both a twitter and a blog follower. This is perfect for any occasion! If I were the very lucky winner I'd lovingly select the slate and ivory foldover clutch. What a cute piece! I could take it everywhere with me! So excited for this chance. Thank you!! ...and thought i would pass it along on my blog..
thanks for sharing about beautiful treasures! what a great shop! I really love the Rosettes on Red and Butterscotch Purse ! My favorite item is the Lace and Pearls Clutch Purse in Champagne and Burgundy. It looks so feminine and romantic! Like all the flower purses and the mustard clutch but my fav' is probably the Embroidered Maroon Clutch - it's lovely. What a lovely shop! I really love the white and green floral clutch. My fav is the rosette on slate purse. So awesome. Thanks. I like the Black on Gray Silver Clutch! 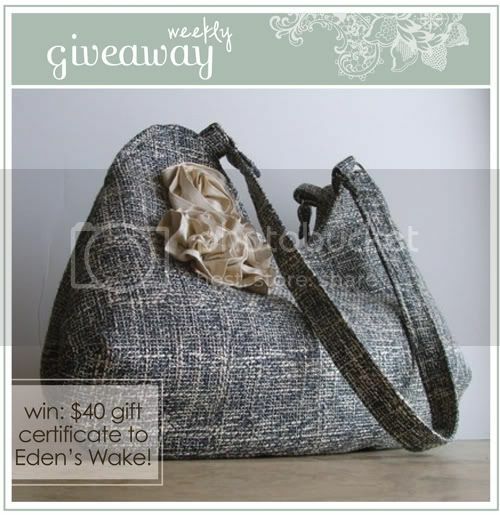 Oooh bag giveaways are my favorite to look at!! I love the red gold and green on black floral purse! Black Lace on Silver Silk Clutch Purse - i think it's the perfect clutch for an evening out with girl friends, date night or a wedding! thanks for a chance to win danni and hope you had a great weekend!! i tweeted about this fabulous giveaway!! Rosettes on Slate and Ivory Purse. Adorable! I love the patterns you use! My fave is the 'white on green floral clutch'. My favorite shade of green! I love the Rosettes on Slate and Ivory Purse! So pretty! Her stuff is amazing, especially the Rosettes on Slate and Ivory Purse. Do pick me! love the slate/ivory foldover clutch and rosettes on slate/ivory purse. love them! Holy cow, the "Rosettes on Slate and Ivory Purse" is so fab! My favorite is the one in the picture above, the Rosettes on Slate and Ivory Purse! Hello! :) I absolutely love the clutch purse in floral red! I love the white clutch with the ruffles on the left bottom hand corner! Gorgeous. My favorite is the Rosettes on Slate & Ivory Purse....what can I say? It caught me in the heading and I can't take my eyes off it. so fun!! i love so many things in there, but the pretty purple flower bobby pins caught my eye! so fun. and I follow on blogger and twitter! love the purple bobby pins! They offer such a wide range of lovely bags! My favourite is the Rosettes on Red and Butterscotch purse, I just adore the shape and colour of it! I love the Black and White Foldover Clutch Purse. Most of my wardrobe is b&w so it would go with sooo much! I love the clips! They so soo cute! The Rosettes on Slate and Ivory Purse is by far my favorite! Oh my they're all so fun! I think I love the rosettes on slate and ivory purse though! its gorgeous! Also I am a blog and facebook follower! oh such beautiful things! my favorite is rosettes on slate and ivory purse! i love the rosettes on cream and ivory purse. gorgeous! I adore the Rosettes on Slate and Ivory Purse in her shop! I like the mustard foldover clutch/wallet. i love the pretty purple flower bobby pins! My favorite is the mustard clutch. The color is fantastic. What a lovely shop! I love reading about mother/daughter shops! I love the Flowers On Blue Pleated Purse! So sweet--and I'd love to win!!!! Please let me win the slate and ivory purse! LOVE. I love the Black Lace on Silver Silk Clutch Purse!! I love the X-Large Pleated Bag in Autumn Leaves! LOVE the Flowers in Aqua and Chocolate Foldover Clutch! i love the yoyo flower pouch. i'm not one for large bags, but this seems just the right size to carry around the things i need. I'm already a follower !! I lov ethe pink flower on ivory clutch! I am so looking for a new purse right now! These are awesome. Thanks for tipping me off to them. I love the Damask purse or the Rosettes on Red & Butterscotch and Brown on Burgundy floral bag makes me swoon! Oops! Sorry...don't know how I commented twice! I am a follower too! The "Paisley on Gr een Purse" is my favourite. I would love to wear something like that! hi there, i recently came upon your site and absolutely adore it! thank you for all of your fun giveaways too. so much fun! with that being said i just love X-Large Pleated Bag in Purple and Green. i've been looking for a new purse/diaper bag and it seems big enough to fit most of mine and my daughters belongings! thanks so much!! I like the black lace on silver clutch. I love the Rosettes on Red and Butterscotch Purse. My favorite item is Flowers on Blue Pleated Purse. It is sooo cute! Impossible not to adore the Rosettes on Slate. Gorgeous! loving the Rosettes on Slate and Ivory Purse. so pretty. I love everything! But I think I love the Rosettes on Slate bag best. So pretty! And just what my wardrobe needs! 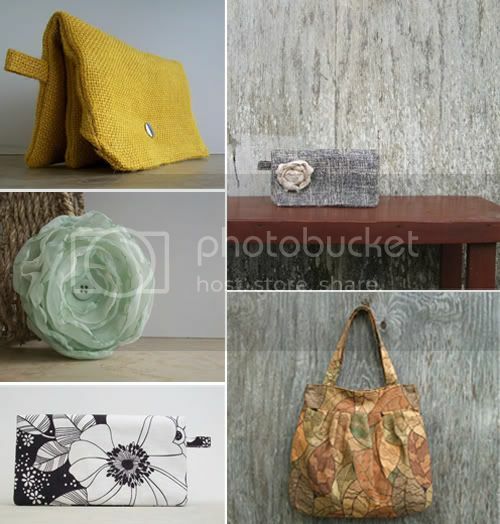 i'm liking the Rosettes on Slate and Ivory Purse that you featured! so classy! And I'm a follower on facebook and twitter! I like the Damask Textured Tan Purse, a very pretty color and roomy enough for everyday use. Thanks for the lovely giveaway. I love the mint flower hairclip! so pretty! Rosettes on slate and ivory purse! I just love the color and texture of the Mustard Foldover Clutch/Wallet! So many beautiful things! I love the Red Chiffon Elastic Headband. Would be so fun to wear! Hello Friend! I just discovered your blog a couple weeks ago and let me say, I am hooked. I love the atmosphere you've created here. It's very open and friendly. And I must say I'm thrilled about this giveaway. Can I say how amazing the Rosettes on Slate and Ivory Purse is? It's tweed-chic and thus absolutely perfect. Anyhow, I just became a follower of your blog and can't wait to see what you post next. I just favorited the Rosettes on Slate and Ivory Purse two days ago on Etsy. Must be kismet! I am torn. I am loving the Rosettes on Slate bag, but that turquiose blue chiffon headband is ADORABLE as well! My favorite item is the Rosettes on Slate and Ivory Purse....though I was eying a few clutches! The Red Brushstrokes Foldover Clutch really makes a statement! rosettes on slate bag! gorgeous! Oh I love the Flowers on Blue Pleated Purse. If I don't win it, I may just have to buy it :o). Thanks for the great op! Wow, I love, love the "rosettes on slate and ivory purse"...it is SO pretty. I'm now a facebook fan, and have also posted on my facebook. Great blog and loving Eden's Wake. Following all on Facebook! i like Black Lace on Silver Silk Clutch Purse! simple and beautiful!! !